Includes rare and historical Washington publications and maps, and Washington State government publications. Includes publications from agencies of the U. S. Federal government in all formats including microfilm, microfiche, paper and digital. Includes genealogy reference materials, city directories, Northwest genealogical microfilm and microfiche. Includes basic book collection and rare, historical materials from the book collection of our first territorial Governor, Isaac Stevens. Includes magazines, journals, and publications such as annuals, newsletters, and bulletins held by the Washington State Library, the Labor & Industries Library, the Natural Resources Building Library, the Washington Utilities & Transportation Commission Library, Eastern State Hospital Staff Services Library and the Washington State Department of Transportation Library. Includes current and historical materials covering the Pacific Northwest region, including maps, manuscripts, videos and DVDs. Includes current and historic Washington newspapers in paper, on microfilm, and on the Web. 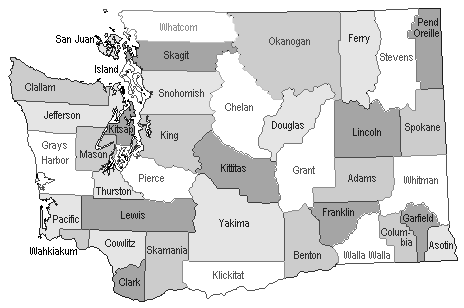 Search Washington newspapers by county using an interactive map. Includes publications from agencies of the Washington State government in all formats including paper and digital. Adjacency Multiple words within quotes are searched as a phrase. "economic policy"
Truncation Use * to search for different endings of the word at the same time. Words may be right-hand truncated using an asterisk. Use a single asterisk * to truncate from 1-5 characters. Use a double asterisk ** for open-ended truncation. environment* retrieves environment, environmental, environmentalism, etc.